, an eminent lawyer and antiquary, the eldest son of John Lambarde, alderman of London, by Juliana his wife, daughter of William Home or Herne, of London, was born Oct. 18, 1536. 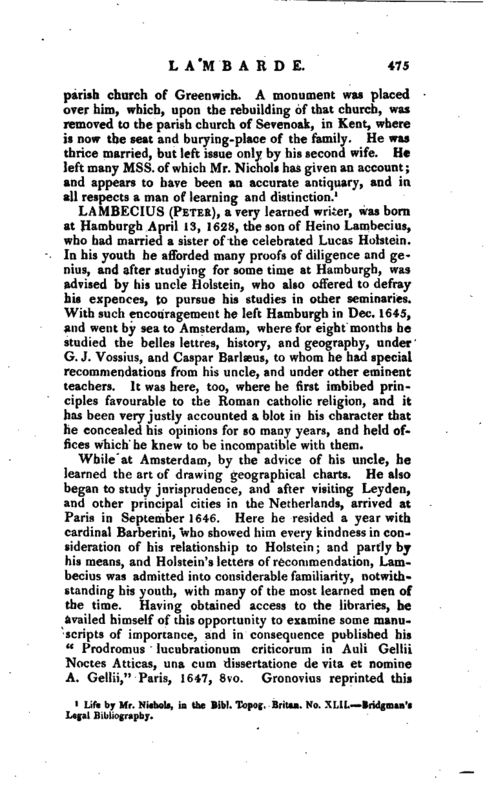 Nothing is recorded concerning the early part of his education, until he entered upon the study of the law, and was admitted into the society of Lincoln’s-inn, Aug. 15, 1556. 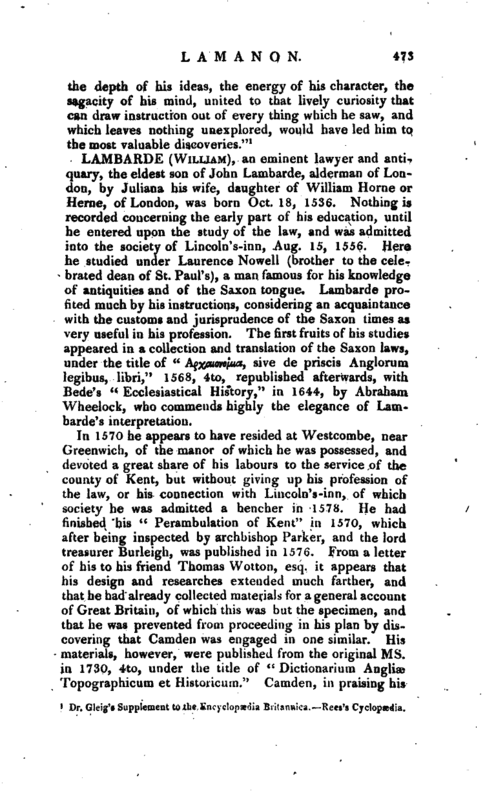 Here he studied under Laurence Nowell (brother to the celebrated dean of St. Paul’s), a man famous for his knowledge of antiquities and of the Saxon tongue. Lambarde profited much by his instructions, considering an acquaintance with the customs and jurisprudence of the Saxon times as very useful in his profession. The first fruits of his studies appeared in a collection and translation of the Saxon laws, under the title of “A^awvo/iw, sive de priscis Anglorum legibus, libri,” 1568, 4to, republished afterwards, with Bede’s “Ecclesiastical History,” in 1644, by Abraham Wheelock, who commends highly the elegance of Lambarde’s interpretation. In 1570 he appears to have resided at Westcombe, near Greenwich, of the manor of which he was possessed, and devoted a great share of his labours to the service of the county of Kent, but without giving up his profession of the law, or his connection with Lincoln’s-inn, of which society he was admitted a bencher in 1578. He had finished his “Perambulation of Kent” in 1570, which after being inspected by archbishop Parker, and the lord treasurer Burleigh, was published in 1576. From a letter of his to his friend Thomas Wotton, esq. it appears that his design and researches extended much farther, and that he had already collected materials for a general account of Great Britain, of which this was but the specimen, and that he was prevented from proceeding in his plan by discovering that Camden was engaged in one similar. His materials, however, were published from the original ms. in 1730, 4to, under the title of “Dictionarium Angliae Topographicum et Historicum.” Camden, in praising his | “Perambulation,‘’ and acknowledging his obligations to it, calls the author” eminent for learning and piety;“by the latter quality alluding probably to his founding an hospital for the poor at East-Greenwich, in Kent, said to have been the first founded by a protestant. The queen (Elizabeth) granted her letters patent for the foundation of this hospital in 1574; and it was finished, and the poor admitted into it in October, 1576. 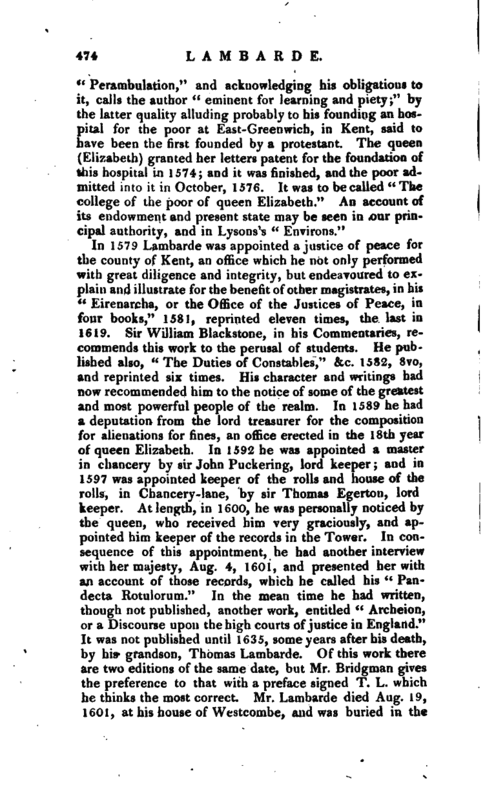 It was to be called” The college of the poor of queen Elizabeth.“An account of its endowment and present state may be seen in our principal authority, and in Lysons’s” Environs." 1 Life by Mr. Nichols, in the Bibl. Topogr. Rntan. No. XLIL Bridgman’a Legal Bibliography.